Perfect for B&O BeoVision 7, BeoSystem 3 and more. 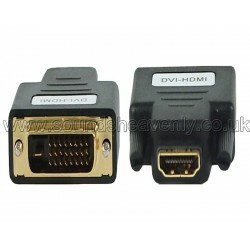 Convert a HDMI cable to allow it to be used with equipment that has DVI-D sockets, eg. some Bang & Olufsen BeoVision 7 TV's and BeoSystem 3 processors, plus a wide range of other products including LCD computer screens. HDMI to DVI adapter, Gold Pins - also suitable for HTPCs! Please note that as DVI-D does not support audio, this adapter will only pass picture/video information - not sound. Please contact us if you need any further advice on how and when to use this product and we will be pleased to help. This adapter features gold contacts and sturdy construction for a long life and a perfect connection every time. Male DVI-D plug on the opposite side. With this item you can connect your B&O BeoVision to a HTPC or computer - turn your BeoVision into a Smart TV!